The spinning top is a very interesting candlestick. Unlike the Marubuzo, it does not give the trader a trading signal with specific entry or an exit point. However the spinning top gives out useful information with regard to the current situation in the market. The trader can use this information to position himself in the market. A spinning top looks like the candle shown below. Take a good look at the candle. What observations do you make with regard to the structure of the candle? What do you think would have transpired during the day that leads to the creation of a spinning top? On the face of it, the spinning top looks like a humble candle with a small real body, but in reality there were a few dramatic events which took place during the day. Small real body – This indicates that the open price and close price are quite close to each other. For instance the open could be 210 and the close could be 213. Or the open could be 210 and close at 207. Both these situations lead to the creation of a small real body because a 3 point move on a 200 Rupee stock is not much. Because the open and close price points are nearby to one another, the color of the candle does not really matter. It could be a blue or a red candle, what really matters is the fact that the open prices and close prices are near to one another. The upper shadow – The upper shadow connects the real body to the high point of the day. If it is a red candle, the high and open are connected. If it is blue candle, the high and close are connected. If you think about the real body in conjunction with the upper shadow ignoring the lower shadow what do you think had happened? The presence of the upper shadow tells us that the bulls did attempt to take the market higher. However they were not really successful in their endeavor. If the bulls were truly successful, then the real body would have been a long blue candle and not really a short candle. Hence this can be treated as an attempt by the bulls to take the markets higher but they were not really successful at it. The lower shadow – The lower shadow connects the real body to the low point of the day. If it is a red candle, the low and close are connected. If it is a blue candle, the low and open are connected. If you think about the real body in conjunction with the lower shadow ignoring the upper shadow what do you think had happened? This is pretty much the same thing that happened with the bulls. The presence of the lower shadow tells us that the bears did attempt to take the market lower. However they were not really successful in their endeavor. If the bears were truly successful, then the real body would have been long red candle and not really a short candle. Hence this can be treated as an attempt by the bears to take the markets lower but they were not really successful. Now think about the spinning top as a whole along with all its components i.e real body, upper shadow, and lower shadow. The bulls made a futile attempt to take the market higher. The bears tried to take the markets lower and it did not work either. Neither the bulls nor the bears were able to establish any influence on the market as this is evident with the small real body. Thus Spinning tops are indicative of a market where indecision and uncertainty prevails. If you look at a spinning top in isolation it does not mean much. It just conveys indecision as both bulls and bears were not able to influence the markets. However when you see the spinning top with respect to the trend in the chart it gives out a really powerful message based on which you can position your stance in the markets. What if the spinning tops were to occur when the stock is in a down trend? In a down trend, the bears are in absolute control as they manage to grind the prices lower. With the spinning top in the down trend the bears could be consolidating their position before resuming another bout of selling. Also, the bulls have attempted to arrest the price fall and have tried to hold on to their position, though not successfully. After all, if they were successful the day would have resulted in a good blue candle and not really a spinning top. Clearly, with no clarity on what is likely to happen, the trader needs to be prepared for both the situations i.e reversal and continuation. If the trader has been waiting for an opportunity to go long on the stock, probably this could be his opportunity to do so. However to play safe he could test the waters with only half the quantity. If the trader wants to buy 500 shares, he could probably enter the trade with 250 shares and could wait and watch the market. If the market reverses its direction, and the prices indeed start going up then the trader can average up by buying again. If the prices reverse; most likely the trader would have bought the stocks at the lowest prices. If the stock starts to fall, the trader can exit the trade and book a loss. At least the loss is just on half the quantity and not really on the entire quantity. Here is a chart, which shows the downtrend followed by a set of spinning tops. The stock rallied post the occurrence of the spinning top. Here is another chart which shows the continuation of a down trend after the occurrence of spinning tops. So, think about the spinning top as “The calm before the storm”. The storm could be in the form of a continuation or a reversal of the trend. In which way the price will eventually move is not certain, however what is certain is the movement itself. One needs to be prepared for both the situations. A spinning top in an uptrend has similar implications as the spinning top in a down trend, except that we look at it slightly differently. Look at the chart below, what can you see and what would be the inference? Having observed the above, what does it actually mean and how do you position yourself in the market? The spinning top basically conveys indecision in the market i.e neither the bulls nor the bears are able to influence the markets. Placing the above fact in the context of an uptrend we can conclude two things..
Or the bulls are fatigued and may give way to bears. Hence a correction could be around the corner. Having said that, what should you do? The chances of both events playing out are equal, how are you going to take a stance? Well, in such a situation you should prepare for both the outcomes! The bears make an entry – When this happens the market starts to slide down, and as you have booked 50% profits at a higher price, and can now choose to book profits on the balance 50% as well. Your net selling price will anyway be higher than the current market price. The stance you take helps you tackle both the outcomes. Here is a chart which shows an uptrend and after the occurrence of spinning tops, the stock rallied. By being invested 50%, you can continue to ride the rally. To sum up, the spinning top candle shows confusion and indecision in the market with an equal probability of reversal or continuation. Until the situation becomes clear the traders should be cautious and they should minimize their position size. The Doji’s are very similar to the spinning tops, except that it does not have a real body at all. This means the open and close prices are equal. Doji’s provide crucial information about the market sentiments and is an important candlestick pattern. The classic definition of a doji suggests that the open price should be equal to the close price with virtually a non existant real body. The upper and lower wicks can be of any length. However keeping in mind the 2nd rule i.e ‘be flexible, verify and quantify’ even if there is a wafer thin body, the candle can be considered as a doji. Obviously the color of the candle does not matter in case of a wafer thin real body. What matters is the fact that the open and close prices were very close to each other. The Dojis have similar implications as the spinning top. Whatever we learnt for spinning tops applies to Dojis as well. In fact more often than not, the dojis and spinning tops appear in a cluster indicating indecision in the market. Have a look at the chart below, where the dojis appear in a downtrend indicating indecision in the market before the next big move. Here is another chart where the doji appears after a healthy up trend after which the market reverses its direction and corrects. So the next time you see either a Spinning top or a Doji individually or in a cluster, remember there is indecision is the market. The market could swing either ways and you need to build a stance that adapts to the expected movement in the market. A trader’s stance based on dojis is similar to stance taken when a spinning top occurs. Great suggestion Kashish. We will try and implement this sometime soon. Is % of Deliverable Quantity to Traded Quantity will impact any of our trading Strategies? That has been on the agenda for a while now, Labhansh. We will do something about this soon. Thanks. This could be replicated for all modules. A set of tricky questions will help sharpen whatever we learn here, and who better than you guys to frame those questions? That is exactly what I was thinking. I infact tried to search over internet some example for each type of Candle so that I can practice more and my mind and eyes can be trained. What do u mean by Red candle day or Blue candle day. If there is a gap up opening, is it Blue candle day? And if it Gap down opening iS It a Red Candle day?. A red candle day represents a bearish day and a blue candle represents a bullish day. There could be a Gap opening, but the gap could be filled intra day hence Gaps as such does not decide the colour of the candle. What is gap up opening or gap down opening? Yes indeed, have written about it in this chapter. Are these material enough for a regular trader or do I need to study more to dig deeper into the topics? Dojis and spinning tops basically convey indecision in the market. Both the bulls and bears have equal strength, hence markets stay flat. Yes, this is possible I guess. I would suggest you email [email protected] for this, they will help you with it. Sir, i would like to know more about dragonfly doji and how reliable it is? Dragonfly Doji is somewhat similar to to a paper umbrella – you can apply the same trading logic to it. All examples are on shares/ stocks but no example on commodities i.e on metals or crude etc. We will include a separate module on commodities and interest rate futures sometime soon. Prakash – will try and do that. Meanwhile you could start doing paper trades. Sir could you please tell what do yuo mean by paper trades? Paper trades is a term used to refer to a dummy trade. No real money is involved, you just assume you have a position and track the profit or loss that arises out of it. People do this to learn and practice trading. Sir, can I start practicing paper trade with the knowledge I have until this chapter ? Great work sir…i learnt a lot. Any stoploss suggestion for Doji/Spinning Top for bullish/bearish trend? Doji/Spinning tops are not really a trading candle, they only indicate that the market is in a state of confusion with equal push by both bulls and bears. Hence tough to call SL levels for these patters. For every other candle use candles high (for short trades) and low (for long trades) as stop loss. Can you please elaborate a little on why the stop loss is selected as the low(or high) of that day’s candle. Low is the SL for all long trades – this is the default price point in candlestick patterns. Perhaps because at this price the sentiment changed. Likewise for the high point, which is the SL for all short trades. can TA be used for shortterm(3-6months),medium term(6-12months) or long term (>1year)? ?.if yes what should be the frequency of chart(1day,1week)?. does it also mean trading frequency will decide the trading days . i mean if we take frequency of 1week ,i can only trade after that week?technically. @thanks to zerodha team &kartik for great piece of knowledge. I suggest to add new successful methods & technique of TA as an examples for better understading. Yes, TA can be used for any time frame you wish. Irrespective of the time frame always look at at least 1 year data. Dear Sir, You have a talent of teaching people in a very lucid language .Kudos to you on that. You can think of educating others as your alternative career. I am not understanding , when i look for charts, trends whatever ,it will present the charts as of date or will it give me patterns predicting future? The idea is that the past patterns help up identify patterns to trade. Back testing is the key. Prattham – Although all the charts display historical performance, I do believe (i have only heard of such things, not seen myself) there are few charts that give out future predictions…not sure how reliable they are. Hi Karthik, most of the time when DOJI present on the chart. It shows a trend reversal. what about your opinion. I just wan to get an answer from an expert . In most of the cases it does happen that way. For GM Breweries, Hanging man formed on 1st and 2nd was a red candle day, as per the analysis done, one should have booked the profits by shorting. but as can be seen today, that price is on a higher side. Can we assume that this pattern doesnt work in this case or i should wait for some more time, to see if it turns out to be a red candle day? the tooltip doesn’t show the data for 1st, the encircled one. Thats an image, hence does not work. Since the current price is higher than the pattern’s high, the hanging man stands invalid. thanks for the quick response Karthik. So, if the pattern is formed on Day 1 and if the closing price of Day 2 is higher than the HIGH of Day 1(even if its a red candle day), hanging man analysis stands void.. please confirm. Yup, this is because the high of the pattern (P1) is considered the stoploss for the trade. hi, in case of the hanging man chart2(BPCL), though the market behaved as wanted, we would make a loss as the high of next day more than the stop loss of the hanging man?? Well, it really depends on the trader. Some traders like to wait till the close (3:15 or 3:20 PM) to estimate of the SL is breached (or not). In such cases you would not make a loss, otherwise you would. Could please explain in brief the meaning of “consolidating their position”. Really need help or example on this “Consolidation”. Consolidating loosely refers to the act of averaging. For example – if you have a previous position, then you add to the existing position. Thank You for the simple & lucid reply Sir. Truly appreciate your active reply gesture, it really helps me a lot. May God Bless You with lots of Bounties in life ! Thanks for the kind words Shafeeq! In some of the comments above “Hanging Man Pattern” has been discussed….Could you explain what exactly is that???? 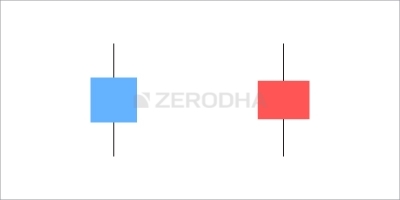 Section 7.3 – http://zerodha.com/varsity/chapter/single-candlestick-patterns-part-3/ explains will this. Sir, am i right in saying that the rule “Buy when strong………” applies only in the case of Marubozu and that it is not a general rule ? It is a general rule —- buy on strength, sell on weakness! if we saw a bearish marbuzo in the middle of the day…..thn what strategy should be use for the next day for intra day trading…..time frame is 5min….. It may not be a good idea to look at a 5 min candle today and take a position tomorrow. I personally prefer 10/15 mins timeframe. Yes, you can use the same techniques for intraday as well! Nice articles, appreciate your time to reply to all the queries & keep Varsity an engaging experience. 1. You have compared Doji to a spinning top(equal shadows) with small real body.I assume that in the case of Doji O=C & hence the authenticity of it is more as the degree of indecision is greater than a regular spinning top. I mean if I have to choose between two trades one with regular spinning top & other with a Doji , I favour Doji more. Are my assumpitons right? 2.Spinning top in presence of any of the other trend reversal candles add more value to the pattern ( Eg: Spinning top & a hammer) means a major chance of trend reversal? 3.In Pi , if right click on chart & select Pivot lines it draws S1,S2,S3 & R1,R2 ,R3 & a Pivot line, are these automated support & resistance lines alternate to the process of S & R that we identify manually . Are there any advantages of using automated over manual in terms of accuracy? 3) These levels are identified by a ‘pivot formula’. I personally prefer the manual version. Will The Spinning Top & Dojis patterns will work with 1 min, 3 mins , 5 mins or 10 mins charts? It would, but I personally prefer looking at it from EOD basis. Your material is a gold mine for many budding investors like me. Appreciate your efforts in this! 1. Is there a good website that provides stock data on companies along with candlestick charts and other charts taught in your materials? 2. What other materials do you recommend studying through, before I make a foray into the trading world? If TA has to be treated as authentic, why is it not possible to list (predict) the top gainers and losers in an automated manner? Why I am asking this is everybody does some TA if they are into short term trading but none of them are consistently successful. So what is the basis for considering TA as authentic or scientific? Can you tell me what is the percentage success you have in this and whether you don’t take news into consideration at all? I hope percentage success is not confidential. TA is not really a science, its more of an art form. This is exactly why TA is not really taught in finance academia. Each person’s experience is different while trading using TA. I never really measured percentage success – but I can tell you this, my losses were contained and TA never let me lose my capital. Over time, I moved away from active trading (owing to a full time job) …but I still continue to invest in markets. I guess the price is 207 then why do you refer to 200 rupees? I can understand its close but what about if the price was 295. I mean the open price of day should be considered as the price. I am a student of physics ,I have no idea of this market or how financial stuff works so my questions may be very naïve or stupid so sorry in advance. TA is not really a science why? Yes definitely its not an empirical one but I see its based on Probability and Statistics, a lot of science is based on it say weather science ,quantum mechanics and a lot. Or there is something I am missing about TA. Does it implies trading cant be taken as a full time job, there is no future. Thank you so much for all your efforts. Its only because of you I am able to understand about equity market looking forward to go through all the modules. And sorry for any stupid question and long post. 200 is a generalization here, Debejit. More for a conversational convenience. If it was 295, I would probably call it 300 Rupee stock. Yes, TA has probability and some amount of stats…but no science backed theories. Trading requires you to invent/discover new trading techniques. I’ve not had that kind of time off late, hence I’ve been investing. What could be stoploss for spinning tops? You would not trade based on spinning top alone, so there is no question of SL. Is rule no 2 ‘be flexible, quantify and verify ‘applicable to spinning top and doji? If yes, then what should be the tolerance in terms of percentage? Yes, it is a general rule applicable to everything in TA. I’m afraid, I dont have a % number for these patterns. But if I were to guess, it would not be more than 0.3%. Dear KARTHIK sir…COuld you please check BHEL’s chart for last 10 days(since 27th Dec 2016). Its primarly in downtrend. there is small bounc since 27th Dec. On 5th Jan, it created a DOJI signaling nervousness. Next day, it went down. I thought that these 2 signs should be enough to bring bull on down foot. So it shoudl now go down. But today, it went up. Could you please help me where i went wrong? Yes, BHEL is in a down trend (primary). Every pattern needs time to evolve, I would not be surprised if BHEL cools off further, eventually. Hi Karthik, So it is not suggested to buy stocks when it is “Spinning tops in uptrend”, right? In case we have already bought, we can sell some and watch the market? Yes, but remember spinning top conveys indecision, so I’d prefer to sell half and wait on the other half. 1) most of the action in market happens within 9.30 AM, so how should i time the entry? 2)suppose a stock is in downtrend and on the day opening the stock is UP by about 2% ; so whether i should look for buying oppotunity or shorting opportunity? 3)how should i confirm that Nifty is bullish or bearish because many time i pick stock which is in uptrend and nifty also bullish But after sometimes Nifty comes in bearish zone , so whether should i pick a downtrending stock or continue with my pick? Should i confirm the NIFTY trend in daily chart and pick stock based on NIFTY trend? 1) Not true. Its a myth. 3) Its always best if your stock and Nifty are trending in the same direction. Give you more conviction on the trade. 1.sir am i want to ask, what time frame is good for intraday trading with these TA. #biku- intraday traders usually prefers 5,10 and 15 min charts for entry and exit. but for determing trend they focus on highers time frame like hourly and EOD(END OF DAY/DAILY CHARTS). EOD shows the high,low,open and close of the whole day. 2) EOD = End of day. No, if you are starting out fresh, I’d suggest you look at EOD charts to set up intraday trades. Once you are comfortable, you could switch to looking at intraday charts to identify opportunities. when you guys say “prior up trend” or “prior down trend” what is approx. no.of candles we should consider? Hi Srikanth, I guess this has come up in the past. If you are looking at end of day chart (and looking for a overnight position), then I would look at at least last 5-8 trading session, which should constitute at least 5-8% movement. My main concern was that in the charts above some time the marked “prior up trend” consists of both up and down trend , but if we look at on a broader scale it would look as UP TREND only. Correct me if my Understanding is wrong- the PRIOR TREND need not be continuous blue or red candles but when we have a broader look it should be UP TREND OR DOWN TREND ..right? Srikanth, this depends on the time frame you are looking at. Trends can change based on the time frame. For example a 6 month chart can look completely different from a 1 year chart, which an look totally different from a 5 year chart. hi,what does it mean 5-8% constitute? and suppose if we are lukin for 1 year chart and all candles are in weekly then how many candles can be consider for prior trends? 5-8% constitutes the range or the % move the stock has to move for the trend to qualify. I guess a minimum of 15-20 weeks should be alright I guess. Does small real body means that there low trading of a securities in a particular day? Does it mean low volume? Sarat, buy strength and sell weak helps you stay on track with momentum. Apply this couple of time to experience it. Am i right if i am saying that most of the times when dozi pattern or spinning top formed, it is the reversal of the trend. Mostly or in 80% situations, it shows a trend reversal. Hard to say, it has a 50-50 change of a reversal or continuation. I would really like to appreciate the efforts that you have put for this exhaustive material Karthik. Kudos to you!! 1. If I’m looking at EOD charts that means I’ll be able to place an intraday/positional trade the next day right? 2. If I plan to enter a trade, is looking at past 3 months data(with weekly candles) sufficient or should I increase the time frame and/or no. of candles? 2) Take this on a case to case basis. There is no hard and fast rules ard this. If you get a convincing outlook on EOD data, then great. Typically, the longer the time frame, longer should be your holding period. hi Sir, if we encounter a doji or spinning top in daily chart, then can we go for STRADDLE strategy? preferring a long straddle by buying ATM CE and ATM PE? (Assuming we are in the first 15 days of the series). Please share your thoughts. Thanks. Yes, as the outcome of a spinning top and doji is uncertain, you can set up a straddle. Please allow for pictures to open in popup with zoom in/out option to clearly understand the candlesticks. These are uploaded pics, Rahul. Not sure if wordpress allows this features. TA techniques work across all time frames. Thanks you Karthik for providing this knowledge. It was a great learning. Sir,hats off to your work.This material is really helpful and written in very simple language.i was searching this type of tutorials on internet.i want to ask that is there any platform which can tell thatvin which stocks doji,spinning top,hanging man or any other formation has formed.because we cant see each stock everyday.. The Charts shown in the module are for 1 day or for 1 week what is the duration of these charts. There are many charts in this module, Inderjeet. I’m assuming most of them are on an EOD basis. In the charts that are used for examples and also if we would do the analysis, what time duration or time frame should we select for intraday analysis? We have options of viewing charts for 1 minute, 3 minutes, 5 minutes to 15, 30 and an hour. Which is best suited? Higher the frequency, lesser is the noise level. Given this, I personally prefer the 15 mins charts. It is difficult to interpret the prior trend. As you have instructed that you see 3-4 recent candles to find a pattern, I got a spinning top on Apollo Tyres. Now just looking at 3-4 candles it seems downtrend but I am not convinced as the looking broadly I seems to be a sideways trade. Well, spinning top on a stand alone basis may not be the best candlestick pattern to trade on. The prior period trend should be at least 5-6 sessions with an at least 5% price movement. In the absence of a strong prior trend, this may not be a good pattern to trade on. Thanks to your TA and the varsity concept in whole i have now started to do understand TA much better and sorry to keep buggging you with questions. I have a doubt while analyzing Nifty50 stocks i found that in case of appearance Doji or Spinning top in many cases the volume are not high(not above or equal to 10 day EMA on vol). In this case can i overlook volume and proceed with analysis as per the rest of the checklist or should i not enter this trade. In general too does volume need to confirm each and every time or can it be overlooked in certain cases/candlestick patterns and if yes what would be those scenarios. Generally speaking, volumes on doji/spinning tops are quite high simply because of the churn on such days. I’d suggest you keep volume in perspective, it helps in building a stringent system. To be a spinning top, what is the min and max value of the range body? In the example it given as 3 and what can be the maximum value. There is nothing like a min/max. The body should be looked at with respect to the overall length of the candle. Thanks Karthik, for short term trading which is best suited, x- 1 day, x- 1 day chart is it fine? Sorry for confusion, Can we use the candle chart with X axis set as 1 day and y axis set as 1 day for short term trading. You can have time on both the axis. X is always time and Y is price, unfortunately, we cannot change this. Bearish spinning top and bullish spinning top have any significance of they appear in up trend and down trend. There is nothing like a bearing and a bullish spinning top. Spinning tops indicate a pause in the market which could lead to continuation or reversal…the chances of which are both 50%. Thanks for making these tutorials available for free. I trading in options daily. I heard that above 2crore turnover in option trading per annum is chargable or restricted ? How to find the resistance of stocks like titagarh wagon -dt. 27.11.17, NRB bearings-dt27.11.17, where they are breaking previous numbers? They are forming bullish marubuzo. How do we identify resistance for such stocks ? Have you checked the S&R chapter? Yes, I did. But here the higher high has broken all past record and I’m not able to get any past reference. Well, in that case, I’m afraid S&R will not come handy. You will have to track the positions closely and trail your stop loss. and i like varsity it provide me a different view to see the market . Tushar, the best trades, at least according to me are the ones where the Dow theory tenets coincide with the candlestick patterns. So I’d suggest you read up on Dow Theory along with candlesticks. In the above chapter in intervals i came across range (range 1.7%, range0.8%). My doubt is of what value the 1.7% is? Guess this is the difference in terms of the open and close. Thanks for all your efforts in preparing this module its really helpful like a beginner to me. How important it is to see the trading volume while i am referring to either spinning tops or Doji?? Do we really have to look into the trading volume or not?? Doji volumes are invariably quite high. Low volume doji are not so frequent. Hi, Is there a free backtesting software. Or is there a place from where we can download freely data of various stocks for backtesting. My understanding is that data for live stocks is paid but not sure for historical data. You’ll soon be able to backtest online, quite efficiently. I’d suggest you wait for another 8-10 days. Thanks. For spinning top you mentioned there is 50% probability to go either way. If we initiate a trade it seems to be more like a blind guess since it is 50% chance even if it involves only 50% of the principal we wish to use. Won’t it be prudent then to avoid trading using spinning tops? On the other hand Doji you mentioned is similar to spinning tops but it is more strong. Hence Dojis lean towards trend reversal. Hence I felt it is ok to take calculated risk on Doji. Am I missing something here? I agree with the fact that if we already have long position and we see a spinning top we can initiate 50% sell(book some profit) and wait and see how the trend progresses. But if we don’t have any position to start with then I don’t see an urge to go long since it is like blind guess(a flip of a coin since you mentioned 50% probability). Yes, if you do not have any position, then you can afford to watch and wait. You do have a point. But with 50%, you are actually prepared for any move. Think about it. And by spinning top having small real body I guess it means that both the shadows should be atleast equal to the length of the real body. If the length of shadows are more then it is better. There is a typo. The subheading 6.2 is repeated twice. Yes, the equal shadows is desirable, but the whole point is about price action – a lot of intraday volatility, resulting in no meaningful change in prices. I’ll check the typo. Thanks for pointing it out. This is amazingly educative content and very simple to kickstart learning path in TA. It would be great though if you guys can add tests/quizzes/assignments. People would be happy to pay for the course I am sure! Yes, this is in the pipeline. All these and more will come up this year! How would we know that a particular day is bullish or bearish? You can always look at the chart to know what happened during the day. If you want to know this in advance, then your guess is as good as mine. There are separate descriptions for Spinning Top and Doji formations. What is the REAL(practical) difference between the two? I can only think of the Doji having the exact same opening and closing price, while with the Spinning Top the price might have altered slightly throughout the session. The only real difference is in the size of the real body. 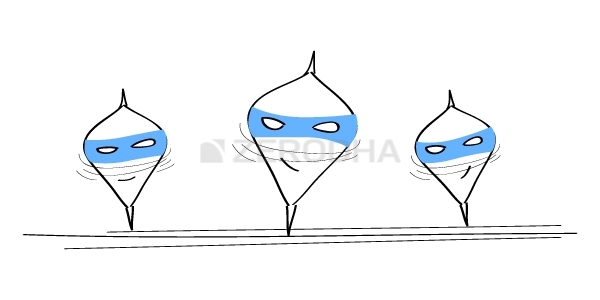 A spinning top has a very small real body whereas the doji has a no or a wafer-thin real body. Dear Sir, As a doji or a spinning top points out the indecision in the market, you have pointed out many times to proceed ahead with just 50% of the capital for trading but Why not stay away from the trade? You can choose to stay away and wait for clarity to emerge. However, what will you do if you have an existing position in the market? Okay Sir, I didn’t think about that. Karthik, How is price of a share a given point decided? Ex: if price of Justdial Ltd at 10 am is 450 and at 2 Pm is 475. How exactly did the price change fro 450 to 475? Does it matter in spinning tops, the color of candles? No, it does not matter. The focus here is on prie action. Can u explain me what exactly is the price action? The regular price movement we see on the stock when plotted on the candle results in patterns. These patterns can be used to set up trades. So this is essentially what price action is really about. Also tell me where i can practise these on charts individually. Look at the charts on Kite. When you do so, try and identify patterns and use that to construct trades. This according to me will be a great start before you start trading with real money. Good luck. Sorry, can you kindly elaborate please? Thanks. I think concepts written in alternate places. Great Material and huge gratitude for being approachable. How does one set the buy/ sell price and stop loss when encountering a spinning top or doji? 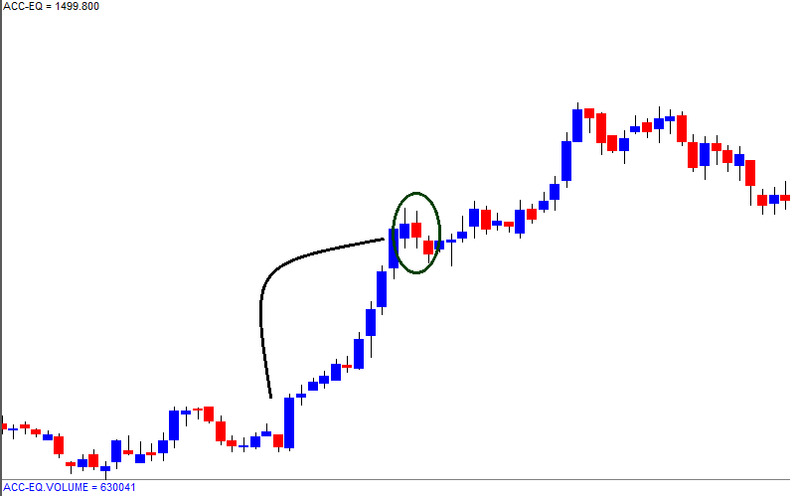 Both these patterns i.e doji and spinning tops are not patterns which give you a stand-alone buy sell signals. They are best looked at in the perspective of the larger trend. What is the meaning of shadow as used ‘spinning top’ material? Does it mean the arrow (line) above or below the body? It just means the line connecting the open/close to the low/high of the candle. It gives a visual representation of the pullback or retracement of the day. I had a question on choosing a stop loss price. I want to give you a hypothetical data of OHLC 60, 69, 55, 58 for a bear candle. I would use the high as the stop loss to sell the stock right ? What would be the entry price for the trade. ? I would hesitate to short this candle, Jeevan because my entry would be around 58-55 and SL would be at the high ie 69…which is nearly 25%. I dint understand the 25 %, I assume it to be the difference between the high and the close, what should be the qualifying percentage to trade for the same ohlc data and how do you calculate it ? The stoploss here would be nearly 25%. Considering the entry @ 55, SL at 69 i.e 14 points. So 14/55 is nearly 25%, which is quite steep for an SL for a trading position. Sir, Around How much should be the SL and entry % be? The best part of the candlestick pattern is that the SL is inbuilt, which is usually the low of the candle for long trades and high of the candle for short trades. Entry too is defined based on your risk appetite. Vinod, translation is not really effective. Have kept this on the to-do list. Does a Doji on day 1 followed by a green/red candle on day 2 qualify as an engulfing pattern? Not really. You need a good red candle on P1. Sir, I have a doubt regarding the prior trend. Suppose, a stock was in a uptrend for 10 days and in the next 4 days it retraces back upto 38.2% of fib level and forms a ‘paper umbrella’. Now, what should we consider as ‘prior trend’ in this case and what should be our interpretation of this formation (Hammer or Hanging man)? Please forgive me if I sound stupid. Thanks in advance. Sudipta, this is a perfectly valid point. In this case, I’d look for buying opportunities because I know the general direction of the trend is upwards. This goes well with this situation because the immediate trend is down plus the larger trend is upwards. So buying makes sense. Thanks a lot for the explanation sir…..
Hello Kartik, to start off, Hats off to your explanation. I have praised your work in every comment that I have posted, but I still feel the urge to do the same again. Let me share a real life experience of how effective your work is. I’m working for BPCL, as part of our corporate training, we are given a training module named “Kalpvriksh.” I remember a trainer who made an excel presentation, seeing which, I was amazed and was drawn into Share markets. Yesterday, I was trying to watch your webinars, to my amusement, I have found out that the trainer had presented the same stuff that you made a video on. It is, “How much money do you need the day you retire? ” Every single word he uttered while making that particular presentation was totally copied from your content. Secondly, I have a doubt regarding the charts. For Intraday, what timeframe is best? Is it 15 min ? I also wanted to know if this strategy works. Alligator indicator combined with Momentum indicator with Pivot points plotted to find out the S&R (only after recognizing a standard pattern). Kindly assume that I’m a risk taker. Could you please help me on understanding what are the Odds of winning the trade ? I’d suggest you use at least 15 minutes chart for intraday trading. Remember, the higher the lower the frequency (like 1 mins, 5 mins), the higher is the noise component in the charts. Hence 15 mins is better than for intraday. I’d suggest you start with momentum indicator, use it and experience it. You can start calibrating it with other components to improvise your strategy. Can you please tell us graph setting of above? We have to check one month or one year graph with 30m or 10m measure? If you are looking at 10-15-30 mins, I’d suggest you look at one month chart. Assuming Rs. 100 as the open price what should be the maximum / minimum closing price for a candle to qualify as having a small body? Similarly, what should be the MINIMUM length of the upper & lower shadow sticks to be qualified as a ‘Spinning Body’? A movement around 0.2 – 0.3% is considered as small candlestick aka spinning top. Always think of it in % terms, will be much easier. These lessons are really useful. Thanks for that. Should we look at intraday charts like 5min,10min etc or look at 1 day charts to analyse the candlestick patterns. Which one would be more accurate. If you are starting fresh, I’d suggest you begin with EOD charts. It appears that Doji or Spinning top should not be used to take a fresh position (buy or sell new stocks). It is useful if you have some existing stock. Yes, these patterns in isolation do not convey any information, but when looked at in the context of other patterns surrounding, then probably you can make sense of it. Shouldn’t it be generally true for “spinning top” candle stick that, if wick is longer than tail then the candle would be bullish & if it is other way round the candle would be bearish. Logic being longer wick suggests stronger bull forces & longer tail stronger bear forces. Moreover wick & tail need not be necessarily equal? The emphasis is on the closing with respect to the opening price and not really on the range of the candle, Mangesh. Thanks for the article but I have one doubt. We already know at any point, irrespective of downtrend or uptrend, there is always an equal chance of price moving in either direction. Spintop and Doji tell us that price can move in either direction. So aren’t they basically useless? They can move in any direction – this is true. But how do you know at which point? When the stock is trending, the probability is more for a move in the direction. Doji and spinning tops kind of tell you at which point the chances become equal. If we toss a coin 9 times and every time head comes up then one would say that the probability of 10th toss being head is high but In reality, it is 0.5. Shouldn’t the same thing apply to stocks? Thanks for the content and when are we gonna get the question system as you said you were gonna implement it? Do spinning tops and Doji always occur in cluster or 1 candlestick is enough ? In the spinning top occurring in downtrend section- you said that one can test waters by buying half qty and if market reverses then exit trade ab book loss, so what should we keep the stop loss as? Unfortunately, both spinning tops and dojis do not suggest any SL. The best you can do here is trail your SL. Thanks for succinctly putting up the content for non finance guys. Please validate my understanding based on the excerpt from this chapter. Does it mean i already own 500 shares (bought) way even before the spinning top formed and riding the uptrend until the spinning top and decided to bet on the spinning top that prices will go down. So i sell 50% of the holdings to book profits made upto the spinning top formation. However, If it turns out against my favor, i.e. the prices tends to continue going up, then at least i would have the remaining 50% holdings to continue riding uptrend. Hi Karthik, really appreciate for your patience to answer all questions in a fantastic way. Just one thing I want know. Some brokers started Stop Loss system for one year validity. I heard that Zerodha also planning for the same. Is it true? Vinod, I’m not sure about the one-year validity thing, these orders are called ‘Good till canceled’ aka GTC. Yes, we do plan to introduce this, hopefully sometime soon. If we have to do positional Trading with time frame of 1 to 2 days or BTST/STBT , then what time frame we need to select for our candle stick graph. I’d suggest you look at EOD charts for this, Manish. Can you tell where I can find EOD charts for the shares. You can check the EOD charts by logging into your Kite account. Yes, the patterns are applicable to intraday trading as well. Sanju, I’d suggest you look at EOD charts, to begin with, even for intraday. Carry the position forward till your target. If a strong opposite pattern occurs before your target, then maybe you can cut your trade and book profits. Its on the list of many things intended to be done, Anirudha. This is really approachable content for new beginners, thank you for this great work. I feel bad that I did not find the Zerodha varsity sooner. Could you please tell me the time frame that you used in the chart images that have added for explanation, I believe they are EOD but just wanted to confirm. Also is single candlestick good strategy for intraday? Vir, these are EOD of charts (unless explicitly stated). Yes, all chart patterns (single, multiple) can be used for both overnight and intraday positions. All your patterns are explained very well. Now assuming i am sitting in the morning to trade. Which candle stick chart should i watch Infact you can have a candle stick for range from 3 mins ,15mins,30mins and so on so which one do you see and place your positions? You need to take a end of day view once to get a perspective of what’s happening in the stock and then look at 5 or 10 mins chart. Of course, this is my personal opinion. Sir, can I know which min candlestick is better for spinning top , marubozu …etc ? All are good, each comes with its own risk and reward characteristics. This really depends on the way you use these patterns and trade the market. 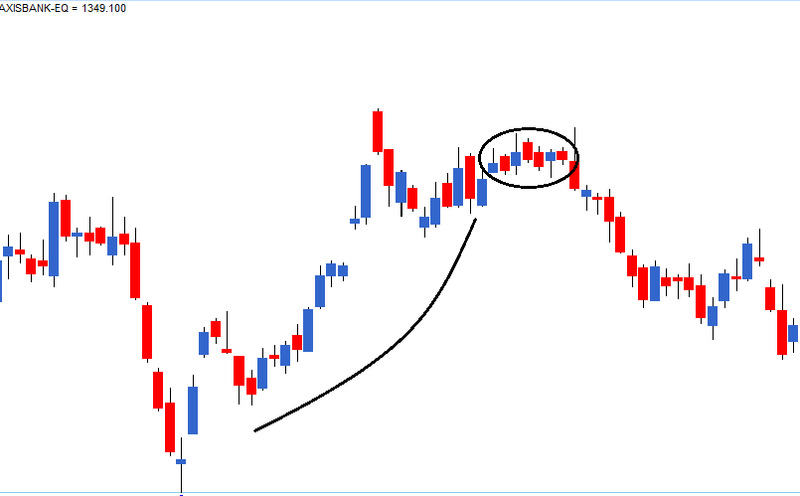 Sir, are there any websites to learn more about candlestick patterns. Like a tutorial, where I can see each company’s pattern or a particular website dedicated only for candlesticks? Sir, a website where I can use what I learnt here to analyse my knowledge about candlesticks. You will have to test the pattern on the trading platform. Have you checked Kite? Okay sir. I will check. 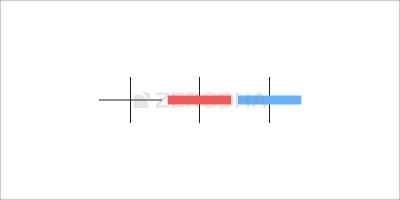 The body of Some blue/red candles look vertical in shape (6.1above ) and some are horizontal ( 6.4 above) What does it mean? These are dojis, Periannan. This is a case where the open = low = high = close for the day. What does exactly booking a loss means in the spinning top candle after the Bearish pattern? If the trader has been waiting for an opportunity to go long on the stock, probably this could be his opportunity to do so. However to play safe he could test the waters with only half the quantity. If the trader wants to buy 500 shares, he could probably enter the trade with 250 shares and could wait and watch the market. If the market reverses its direction, and the prices indeed start going up then the trader can average up by buying again. If the prices reverse; most likely the trader would have bought the stocks at the lowest prices.If the stock starts to fall, the trader can exit the trade and book a loss. At least the loss is just on half the quantity and not really on the entire quantity. The trader wants to go long so how is it a loss situation? So you go long, and the price drops below your purchase price, you’d make a loss right? Considering that the candle stick patterns can be viewed upon various ranges (such as at week level, day level and also for months), what would be the candlestick range to be used, if we need to do intra day trading (i am just giving this as a example). For the short term trade (intraday), I’d suggest 10 to 15 mins. For everything else maybe EOD chart works. It’s good initiative taken by zerodha and You. All these things is informative for beginners. All these single candlestick pattern signal is used only for days candlestick or it can be used also for 1 min or 5 min or 1 hours of technical analysis. They can be used across different time frames, Hemant.